A wet start to Sunday with more showers forecast which always poses a problem of what best to do. I had the same problem in Berlin last year and perhaps not surprisingly the same solution – visit a science and technology museum! So once breakfast was disposed of I resolved to do that. Happily the National Technical Museum (Národní technické muzeum or NTM) was located less than 30 minutes walk from the hotel (albeit, some of those minutes were spent ascending to the top of a steep hill – the sister of the one I ascended yesterday). Once at the top the views would have been excellent apart from the overcast, drizzling weather. The museum itself is housed in a perfect example of what you might call ‘Communist brutal’, being a huge, grey building with aspirations towards imposing but leaning heavily towards oppressive. A similar building next door housed the Agricultural Museum, but I had no intention of going in there – I am not weird you know! Despite the glowering exterior, inside the NTM was light and bright, with a definite Art Deco feel to the surroundings. Having paid the entry fee of about £7 (220Czk) I was free to wander at will. 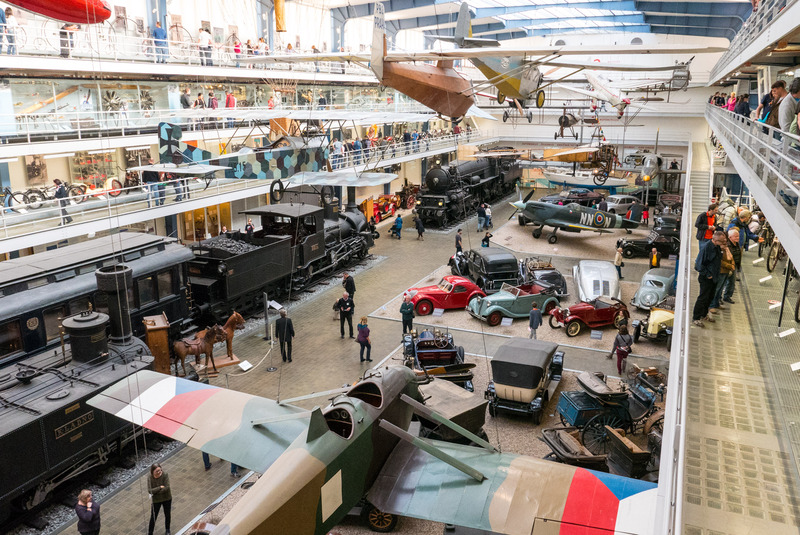 First port of call was the massive transport hall – a giant galleried hangar – full to the brim with cars, motorcycles, trains, planes and boats from all periods of Czech history. I had been warned by Tripadvisor that the galleries here had a strict one-way system in place for walking round, and to break it was to risk a strict telling-off from stern ‘still living in the Communist-era’ museum staff. Well, loads of people were wandering randomly in the most decadent ad-hoc Western manner and I never noticed the staff intervening. Maybe someone caught someone on a bad day? I spent ages wandering through the story of Czech transportation, and was only surprised by how poorly Skoda were represented, given the massive success they are today. Lower part of the Van De Graff generator at the NTM – I think this picture looks like an album cover ofr the band of the same name. Freed from the transport hall I wandered through several other floors of exhibits on different themes. I particularly liked the architecture floor, full of models (some of them life size details) and dioramas of Prague buildings by famous designers. But practically all of the floors held something fascinating, and I could have returned time after time to find new things to see an do. For example, the interiors alone were worth the price of admission. I have already alluded to the Art Deco entrance hall, but this was continued right through the museum. 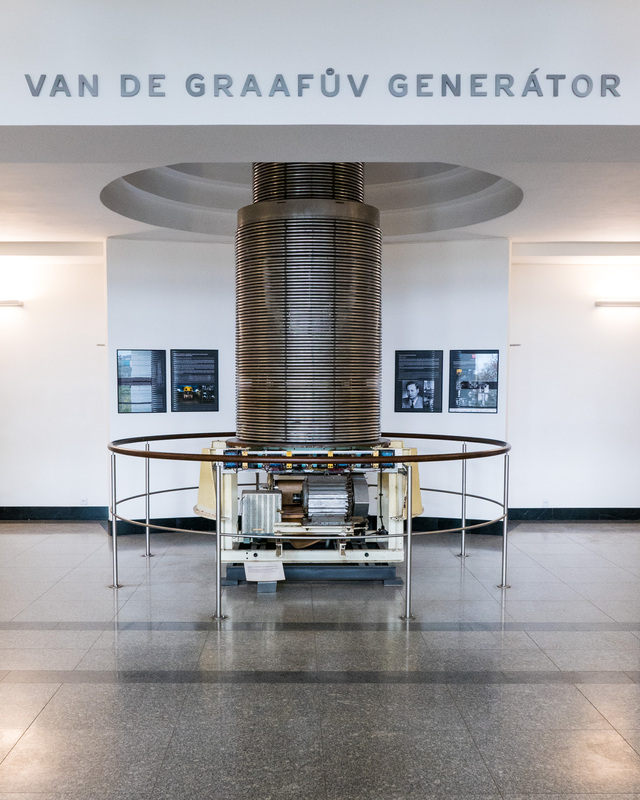 The staircases and lobby of each floor were grand masterpieces of marble and glass, one of which contained the enormous lower half of a Van De Graff generator, alas not working. By this time I noticed from the windows on the upper floor that the weather outside was much better than when I arrived, with decent hints of blue in the sky, so considered it a good time to head outdoors. But first a brew and maybe a bite, so down into the basement to the cafe we go. This turned out to be a perfectly accurate reconstruction of a cafe from Communist times, with formica-topped tables, and a very limited menu of unappetising-looking food, all overseen by unsmiling ladies with the build of former Olympic shot-putters. Except it wasn’t a reconstruction, it was the real museum cafe. I managed to extract a coffee and a cake of uncertain provenance for not much money, but not much joy either. View along the Vltava towareds the Charles Bridge from the Pražský metronom. 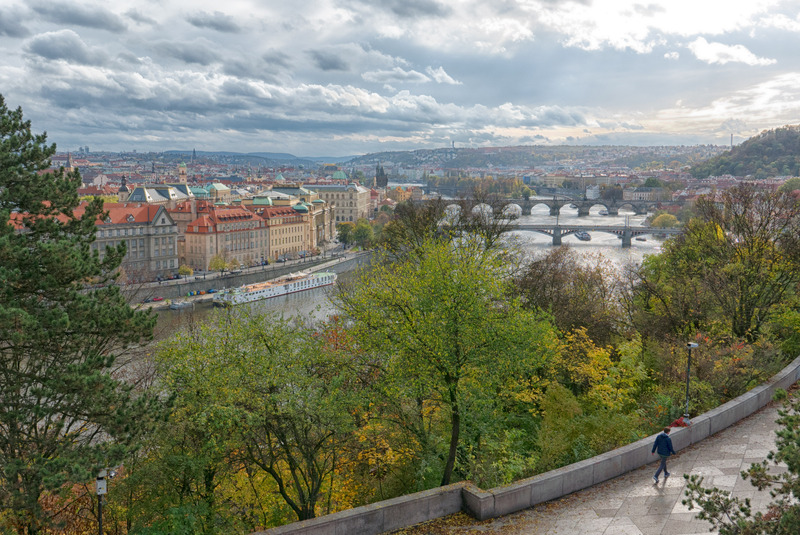 Directly in front of the museum is Letná Park on the hillside overlooking the Vltava river and the Old Town. I headed towards a sculpture called the Pražský metronom, which is a working metronome over 75 feet tall erected on a plinth that apparently once housed a statue of Joseph Stalin. Wikipedia claims that this is a meeting place for young people and I can confirm that is correct, because not only were there many young people in attendance, but the place was graffiti-tagged to hell. I am not quite sure whether to approve or sternly disapprove. By now it was past mid-afternoon, approaching the time that the conference registration was due to open, so I made my way north towards the Florenc business district to the Hilton Hotel, which was to be our venue. Walking up to the hotel I was glad I wasn’t staying there, despite the grandeur of the interior (more on that anon), but because it was marooned in the middle of dual carriageways, and a long walk from the Old Town. The Ibis might be much more humble (and a lot cheaper) but it was really well placed for walking round the city, not to mention surrounded by the hustle and bustle of the shopping, markets and street food vendors. I actually like having trams screeching by below my bedroom window. 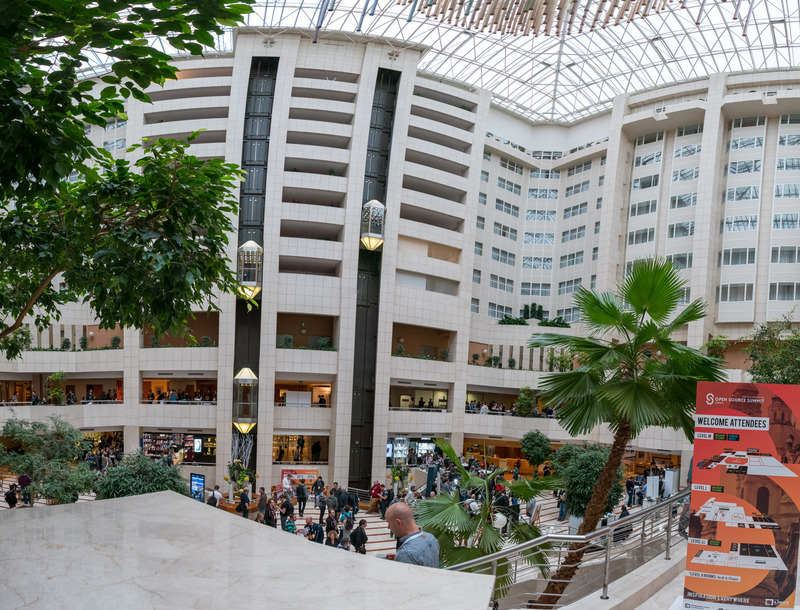 But back to the interior of the Hilton; threading my way past all the executive cars and doormen and entering the hotel, I was greeted by a very impressive atrium area going up the full height of the building. It was really quite the sight given the rather bland, boxy exterior of the hotel. It didn’t take long to register for the conference, then it was the weary 20 minute hike back to the hotel and my sightseeing was over for another year. 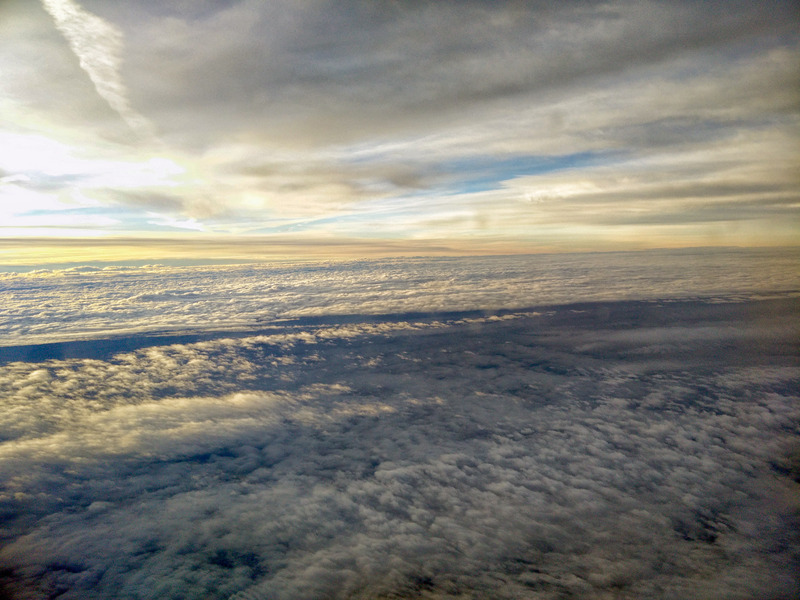 It’s the time of year again when I get the chance to travel to a European capital for a computer conference related to work. Because my employer is paying for flights and transfers, it’s a small matter to tack on a couple of days of my own for the happy purpose of wandering around and gawping. Two years ago I got to go to Dublin, last year was the turn of Berlin, and this year I was hoping for Tallinn – just to keep the -‘in’ endings theme going – but alas it’s Prague. No, I jest. I was thrilled when they announced it would be Prague because it’s a place I have never been and always fancied visiting. It looks exotic in an East European way, whilst the Slavic language and alphabet makes it sound exotic. However, in reality you have to remember it’s just a 3 hour drive from Vienna. Not that Jet2.com took even that long from Manchester. Less than two hours after takeoff, on a morning containing one very early start, saw our 737 dropping below some impressively low clouds onto the runway at Václav Havel Airport.